Let me start by asking you this: how would you decide where to go to uni? Ask advice from someone who’s been in your shoes and is at the uni you’re considering? Gather information about the uni from all sources including lecturer videos and written resource? Speak to faculty members about the course and your unique future career options? See what the place is like, take a tour or sample a lecture? At iVent we’ve worked with universities on their student recruitment strategies for a decade and this significant experience tells us that students use a mix of the above options in order to reach their final decision to apply, and then ultimately accept an offer. Our experience shows us that prospective students want to liaise with students like themselves to gain vital peer-to-peer insight about everyday life and course information. But at some stage in their decision-making process, they will also want to really do their homework and delve deeper into the university to make sure it’s going to be the right place for them to live and learn. This is why we’ve specifically created a virtual communications tool which is fully responsive to all a university’s needs, as and when they occur. So, as well as hosting simple online chat interactions, we offer the flexibility to expand your options at any time to allow the university to showcase seminars and lectures with a webinar function as well as give students access to a full virtual open day event with live video chat, course webinars, presentations about accommodation, how to apply and visa applications and also 360 campus tours. 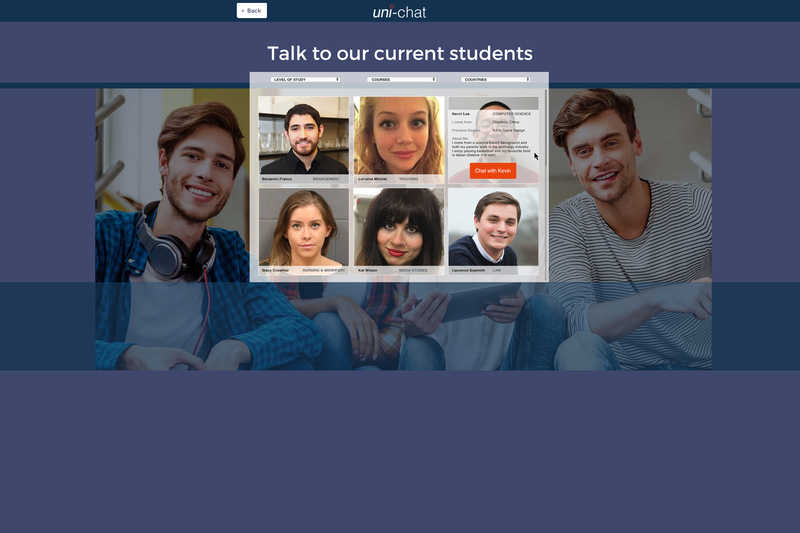 Uni-Connect is the only virtual event and live chat tool that not only gives meaningful and lasting engagement with prospective students but allows the choice of running a simple online communications function AND/OR hosting a fully integrated virtual event. What this means is that if you start by taking a chat function and then decide to opt to add other virtual elements, you don’t need to change supplier. We do it all and everything is seamlessly integrated including in-depth metrics, analytics and data capture, which can also integrate with your CRM.